Periorbital rejuvenation with neurotoxins and dermal fillers address several aging changes. Safe and effective results require a thorough understanding of periorbital anatomy, proper injection techniques, and complications of these products. Prompt recognition and treatment of complications can minimize their adverse impacts. Complications can be divided into ischaemic and non-ischaemic effects. Hylauronidase, an enzyme that degrades hyaluronic acid, may improve outcomes after intravascular hyaluronic acid fillers. Blepharoplasty is amongst the more frequently performed aesthetic procedures with surgery performed by physicians and surgeons across a variety of sub-specialities. 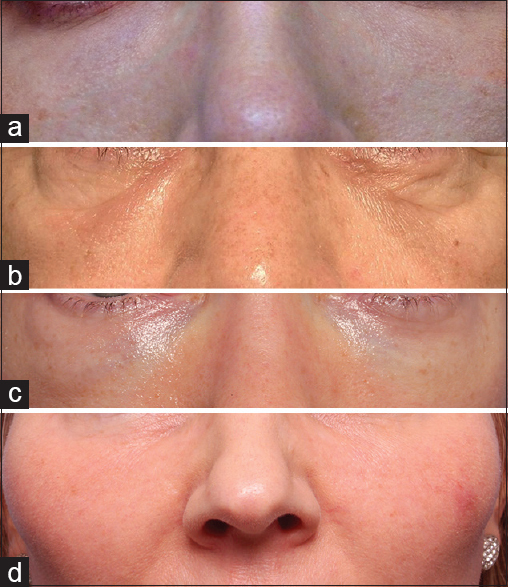 This paper, aimed at a dermatology audience, describes patient selection, eyelid anatomy, clinical examination and surgical steps to achieve successful upper and lower lid blepharoplasty outcomes. Recommendations for minimising complications are made and photographs used to illustrate important clinical and surgical features. Conventional acne treatment presents several challenges such as intolerable side effects and antibiotic resistance. Dermocosmetic products may be used to reduce these unwanted effects. Dermocosmetics include skin cleansers, topical sebum-controllers, skin antimicrobial/anti-inflammatory agents, moisturizers, sunscreens, and camouflage products. Appropriate use of these products may help augment the benefit of acne treatment, minimize side effects, and reduce the need for topical antibiotics. In Asia, there is currently limited scientific data on the application and recommendations for dermocosmetic use in acne vulgaris (AV). This article reviews the evidence on dermocosmetics for AV and provides practice recommendations as discussed during the 4th Asia-Pacific Acne Leaders' Summit held in Bangkok, Thailand, on 7 and 8 February 2015. Through a premeeting survey, a series of plenary lectures, a stepwise program of discussion sessions, and Medline article review, the Expert Panel set forth relevant recommendations on the role of dermocosmetics as adjunct for treating AV in Asian patients. Background: As the ptotic brow drops below the supraorbital rim, it can exacerbate dermatochalasis by pushing the adjacent skin of the upper lid further down. 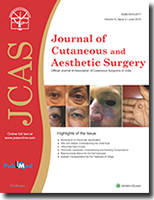 Aim: The purpose of this study was to evaluate the outcomes associated with a combined pretrichial brow lift and upper lid blepharoplasty in patients with dermatochalasis and mild to moderate brow ptosis. 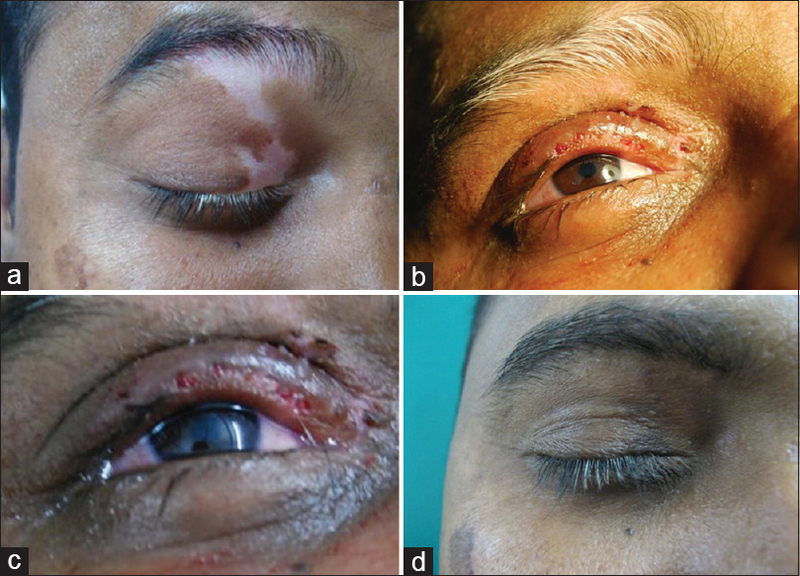 Materials and Methods: A retrospective case series of 46 patients with dermatochalasis and mild to moderate brow ptosis treated with a combined, bilateral pretrichial brow lift and upper lid blepharoplasty from January 2008 to December 2011. 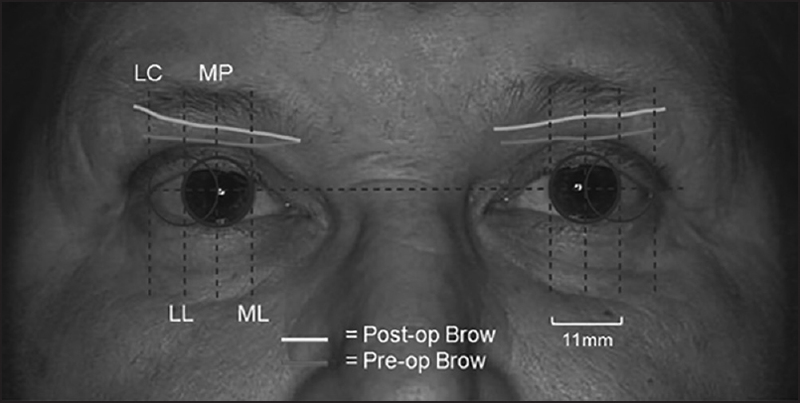 Main outcome measures included measurements of brow lift at 3 months post-operatively, complications encountered, patient satisfaction and surgeon satisfaction. Results: Outcomes from 46 patients were evaluated. 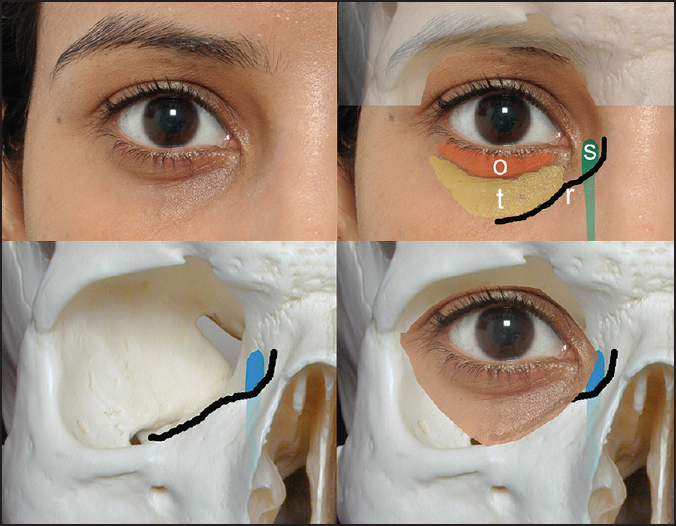 The mean brow lift was 1.85 mm at the lateral canthus, 1.54 mm at the lateral limbus, 1.31 mm at the mid-pupil, and 1.07 mm at the medial limbus. Brow lift at the lateral canthus was significantly more elevated than at the medial limbus (P < 0.001). Minor complications were encountered in seven of 46 patients (15.2%). Mean patient satisfaction score was 3.20 and surgeon satisfaction 3.24 (max = 4, very satisfied). Conclusions: The modified pretrichial brow lift offered effective lateral lift that complements an upper lid blepharoplasty. This technique was met with a high degree of patient and surgeon satisfaction, and had a minimal complication profile. Background: Eyelash leucotrichia is cosmetically disfiguring condition and remains a therapeutic challenge in successful management of vitiligo. Aims: To study the efficacy of eyelash transplantation in management of eyelash leucotrichia associated with vitiligo. Materials and Methods: Fifteen patients with eyelash leucotrichia were treated with follicular unit transplantation. Improvement in leucotrichia was evaluated using objective assessment. Results: Out of fifteen patients, good to excellent response was seen in 13 patients (86.67%), fair in one patient (6.66%) and poor in one patient (6.66%). 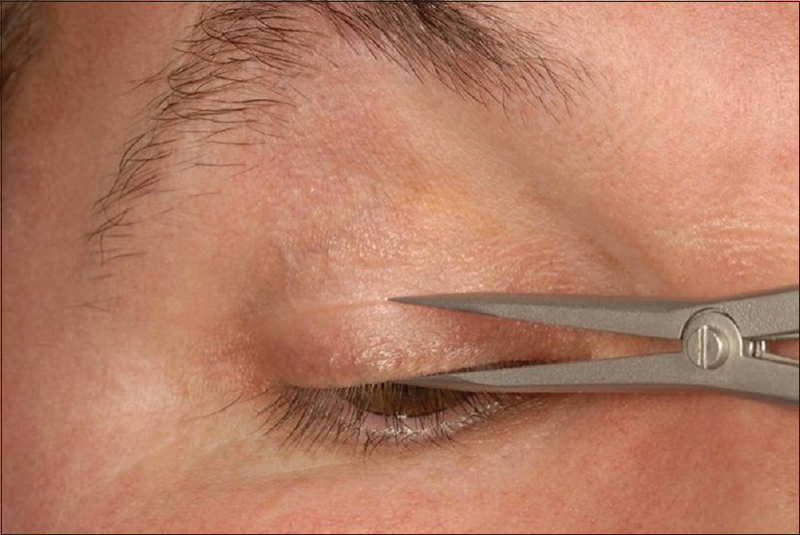 Conclusion: Eyelash transplantation is safe and effective method for eyelash leucotrichia. Background: Striae are linear atrophic depressions that form in areas of dermal damage in the skin. As on date, no consensus or protocol exists for the treatment of stria rubra. Topical retinoids, chemical peels, microdermabrasion, radiofrequency, photothermolysis, intense pulsed light and lasers are some of the modalities used. Aims and Objective: To compare the efficacy of various therapeutic modalities in striae rubra. 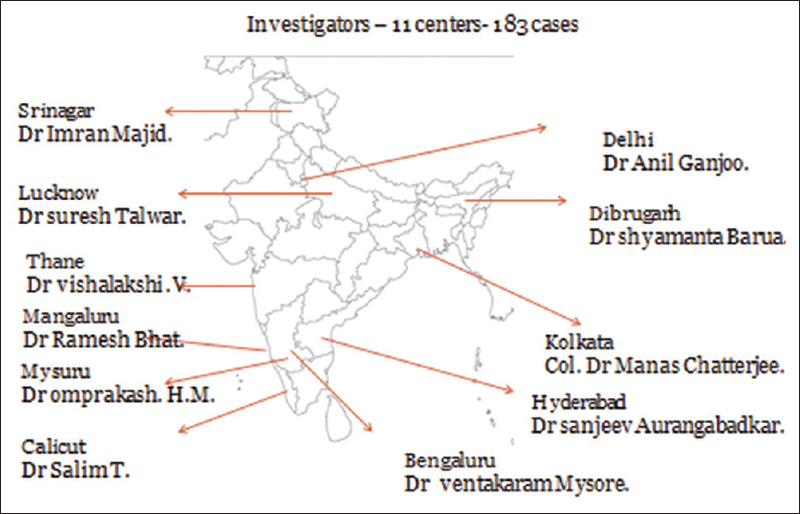 Methods: This prospective cohort study comprised of a total of fifty patients from August-2012 to October-2013 in a tertiary care center in Western India, Gujarat having striae rubra. They were randomly divided into five groups of ten patients each. Patients were evaluated on the basis of visual assessment, both by doctor as well as the patient. Group I was given topical tretinoin (0.1% w/w) gel applied once at night, Group II-microdermabrasion (MDA) combined with trichloroacetic acid (TCA) (30%) peel, Group III-mesotherapy, Group IV-Q-switched Nd: YAG laser, and Group V-combination treatment of microdermabrasion, salicylic acid peel and retinol (yellow) peel. Patients were treated at an interval of 15 days for 2 months and then at monthly intervals. Objective assessment was done at 2nd month, 6th month, and at the end of 1st year. Results: Patients in Group I treated with topical tretinoin showed the least response with 80% (8) of them showing minimal clinical improvement (0–25%) as compared to patients in Group V in which 60% (6) patients showed moderate clinical improvement (50–75%). While majority of the patients in Group II, III, and IV showed mild clinical improvement (25–50%). Conclusions: Striae rubra is a common cause of concern for adolescent population. Combination treatment with microdermabrasion, salicylic acid and retinol yellow peel gave superior results as compared to other therapeutic options. 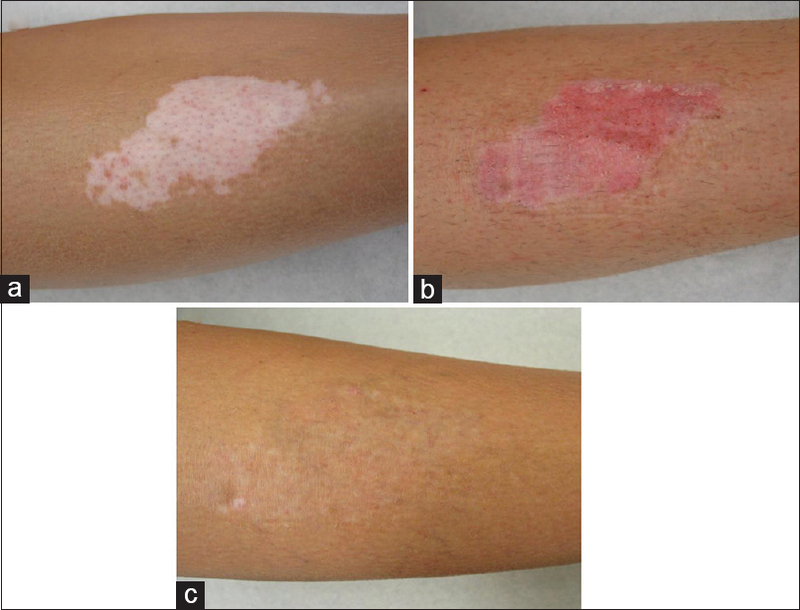 Mild to moderate improvement was seen with Nd: YAG laser, mesotherapy and MDA + TCA whereas minimal improvement were seen with topical tretinoin. Basal cell carcinoma (BCC) is the most common skin cancer worldwide. Surgical excision is considered to be the primary therapeutic modality wherever possible. For inoperable cases, 5% imiquimod seems to be a good alternative. 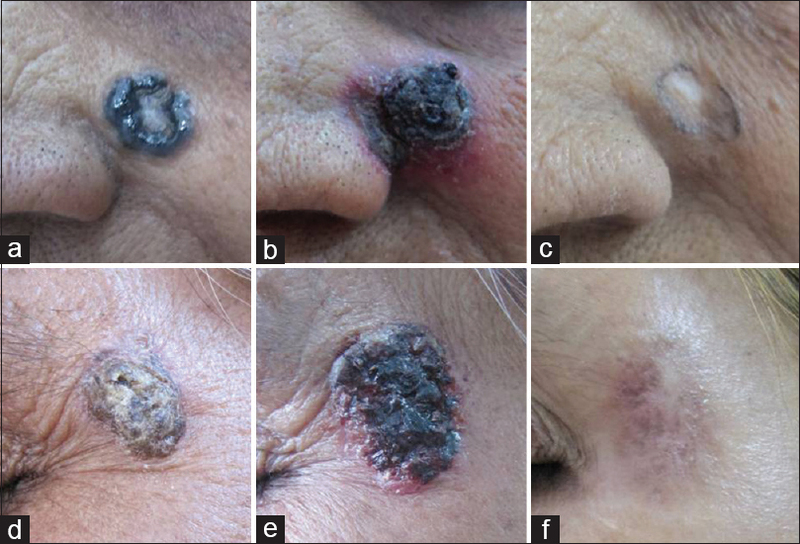 We present two cases of nodular pigmented BCCs on the face in elderly women successfully treated with 5% imiquimod cream application resulting in complete clinical clearance of lesion as well as on histology and dermatoscopy. There was no recurrence of the lesion on 2 years follow-up for the first and 1.5 years for the second patient. Cysticercosis is a parasitic infestation caused by the larval form of the tapeworm, Taenia solium (T. solium). The common sites for cysticerosis include the brain, eyes, and skeletal muscle. 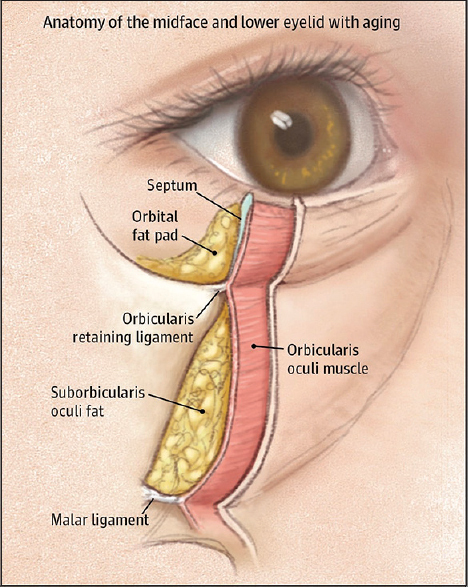 Ocular or adnexal involvement is commonly seen with the commonest ophthalmic site being subretinal space and the vitreous cavity. However, only a handful of cases of eyelid cysticercosis have been reported in the past. We report a rare and unusual case of isolated eyelid cysticercosis in a middle-aged woman masquerading as an asymptomatic slowly growing subcutaneous painless mass in the left eyelid which was presumed to be a benign skin mass, a cyst of appendageal origin such as an epidermoid cyst. 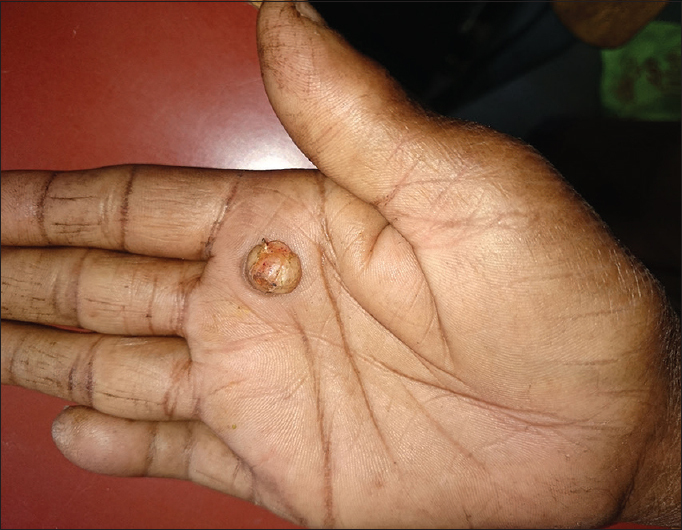 This case highlights the ubiquitous nature of cysticercosis in tropical countries and the need for a high degree of suspicion while surgically treating subcutaneous masses. We would additionally emphasize the need to rule out neurocysticercosis in such cases.